Visit our shop located at 22 Thomas Street, Limerick for an inspirational shopping experience. a range of hand crafted gifts and home wares. Free your home of new or once loved items! Could you set up a Donation Station in your workplace to donate brand new or quality used goods? A Donation Station is a designated space in your workplace where bags filled with quality items can be dropped off by you and your colleagues and then delivered to our shop. We will then sell your items which will help us to fund the services provided by Milford Hospice. Would you like to meet new people and volunteer with us whilst supporting the work of Milford Hospice? As a retail volunteer you will be the face of Milford Hospice and make a difference to how the public sees us and the work we do. Your time and skills will help us to raise vital funds in aid of Milford Hospice. Retail experience is of benefit but is not essential as training is provided. Our retail volunteers donate 3 hours of their time per week and support the team in a wide range of activities both behind the scenes and on the shop floor. 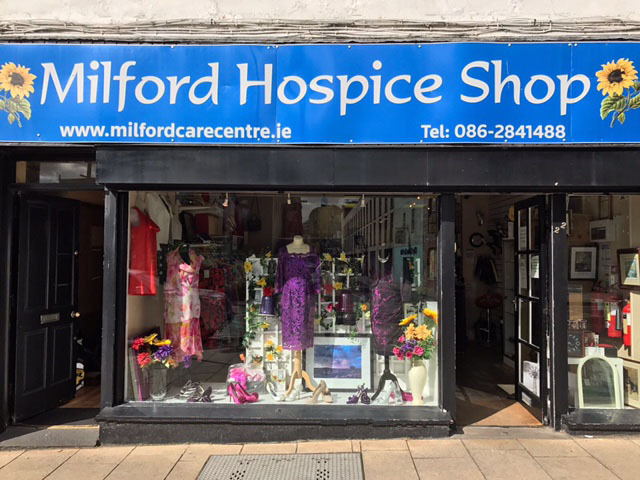 Our Hospice shop is located on 22 Thomas Street, Limerick and is open Monday to Saturday from 9.30a.m. to 5.30p.m. 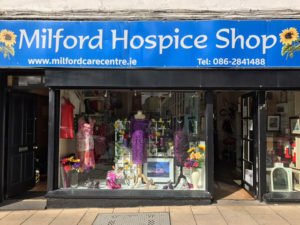 To contact the Milford Hospice shop telephone 086 2841488. Please do not leave items outside the shop when the premises are closed.